Early in 2017, I made a decision to cross-over my scuba diving instructor rating to RAID. 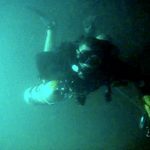 Having already taught for PADI, BSAC, SSI and ANDI over the last 15 years, I was initially hesitant to rush towards another agency at the drop of a hat. 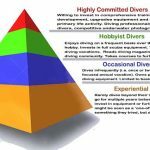 Nonetheless, I had for many years searched for a diving agency that I felt would match the high standards, principles of instruction and ethos that I’ve aspired to. RAID seemed like a very good match. 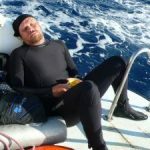 RAID (Rebreather Association of International Divers) has only become a ‘mainstream’ diving agency in the last few years. 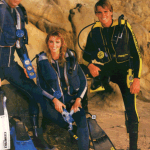 It was previously a very niche agency dealing only with rebreather training, specifically the Poseidon MkVI. 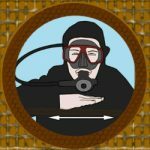 Since the employment of Paul Toomer as RAID Director of Training in 2014, the agency has expanded into all facets of recreational and technical open circuit training, along with free-diving and, of course, a very comprehensive CCR syllabus. 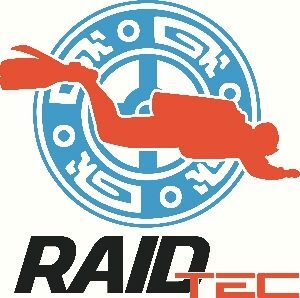 In 2016, RAID joined the WRSTC (World Recreational Scuba Training Council), followed by ISO Accreditation and European Underwater Federation certification in 2017. What I liked about RAID was that they weren’t trying to emulate the big mass-market diving agencies. In that respect, they were aiming for quality, not quantity. 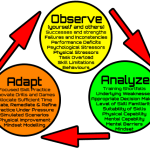 That was reflected in the comprehensive nature of their syllabus, as well as having stringent and measurable performance standards at every level of diver development. 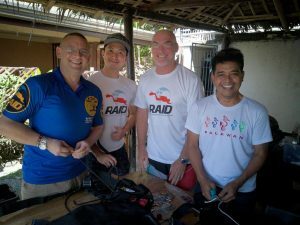 RAID is not “trying to teach the world to dive“, but rather, they want to offer high-calibre diving education for those divers who seek more proficiency, safety and enjoyment when underwater. 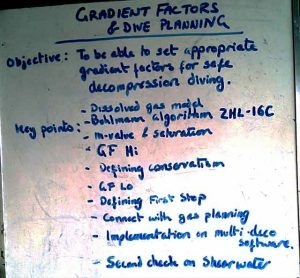 From a technical diving instructor perspective, I liked that the high standards in the RAID curriculum should do an efficient job in preparing recreational divers to prerequisite competency in fundamental skills for technical diving. After all, RAID is fundamentally a technical diving agency, so it makes sense that their syllabus works towards a longer-term goal of giving divers the right skill proficiencies, from entry-level onwards, to enable a seamless progression into increasingly more advanced diving levels. I was also impressed with the actual RAID tech syllabus; which more closely reflected the structure of ‘DIR-type’ courses (for instance, the RAID Deco50 is quite similar in structure and outcome to the Tech1 level courses offered by agencies like GUE and UTD). At the same time, RAID didn’t seem constricted by very rigid principles. The standards are high and there’s a definite strong focus on best-practice approaches, but not to the point of inflexibility or dogmatic adherence to a solitary means of achieving success. 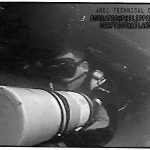 The final factor that peaked my interest was that I saw many highly respected technical diving instructors moving over to RAID; Jill Heinerth, Steve Lewis, Glenn Campbell and Gary Dallas amongst them. These were people who’ve always inspired me professionally. I figured that there must be something special going on to have attracted these elite-level technical educators into RAID. 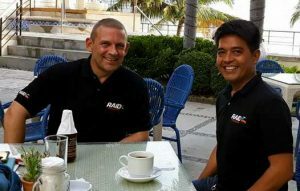 With all that in mind, I met the RAID Philippines manager, James Omac, on several occasions during 2016-17 and we spoke at length about the RAID system and the dive training industry in general. I was impressed by what I heard and, after great deliberation, started on the path to becoming a RAID instructor. The first steps were to complete a mass of online theory training modules. These were the same courses that RAID students undertake, plus the instructor level classes also. 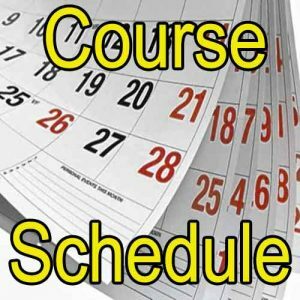 All of RAID’s theory learning, for every course, is done online, including electronic manuals, quizzes and final exams. 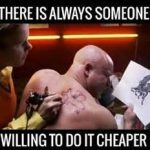 Unlike some agencies, this isn’t a ‘premium upgrade’; it’s the standard approach. RAID has invested heavily in writing and publishing their online courses over the last few years. I found the elearning to be very straightforward and convenient from the comfort of home. 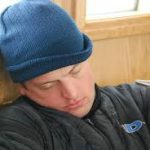 As I went through each course, from Open Water onwards, I was impressed at the modern, comprehensive content of the manuals and the exacting syllabus of the in-water training modules. Overall, the RAID recreational level courses are far more robust and proficiency-orientated than many agencies. This is reflected in both the volume of skills taught and the standards with which students are expected to demonstrate competency. The curriculum stresses the need for solid fundamental skills at every level. Buoyancy, trim, propulsion and team diving are developed to a very high degree, right from the start. Students learn proficiencies like DSMB deployment, SAC measurement and calculation, long-hose air-sharing and the use of redundant gas systems, as routine elements right from the entry-level of training. During this time I also became acquainted with how to administer student training on the RAID electronic system, the stringent risk management process used, and the high expectations that RAID demand in respect to instructor proficiency and skill demonstration. Everything in RAID is taught and practised in neutral buoyancy, accurate horizontal trim and with minimal depth variation. Having been a technical diving instructor for over a decade, and having also to sacrifice countless hours to remediating student buoyancy/trim and other fundamental deficiencies, this was music to my ears. 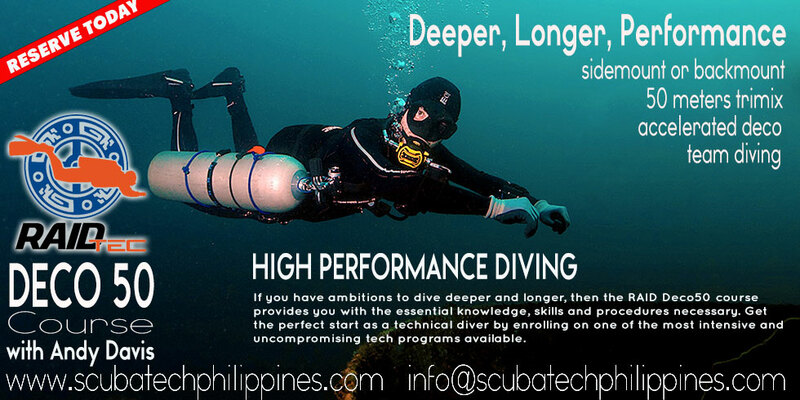 Over the space of a few months, we arranged my technical instructor cross-over to be held in Anilao, Philippines. 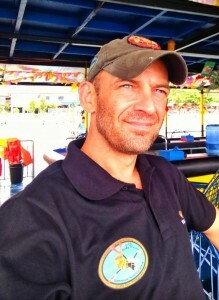 Glen Campbell took time from his busy schedule opening up a new dive centre in Phuket to fly over and run the course. Glenn has been a friend of mine for many years since we first met whilst teaching technical wreck classes here in Subic Bay. 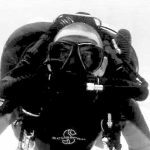 Glenn is an enormously experienced and highly respected technical diving educator, with decades of experience as a multi-agency trimix and CCR instructor-trainer. I was genuinely relishing the chance to get some quality in-water training time with him. Even as a well-experienced tech instructor, I believe there’s always something new to learn and improvements to be made. James Ormac hosted the course at his new resort, ‘Matahari‘ in Anilao, near Batangas City. The resort fronts onto a clean sandy beach and there’s a smooth sandy slope, with many coral outcrops, leading down into the depths. It’s the perfect location for all levels of recreational and technical training. In the evenings, the resort faces west, so there’s always a magnificent sunset over the ocean as we de-brief the day and sup a cold beer. The rooms were clean and comfortable, which is critical for a good night’s sleep after each demanding day of training. The food, I should note, was spectacular – standing easily amongst the best I’ve had at any resort or hotel in the Philippines. The cross-over course started with a formal introduction to the RAID technical diving curriculum. 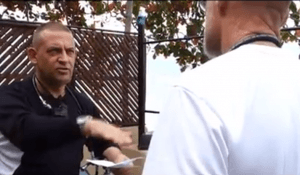 The principles and ethos of the RAID technical diving system were clearly explained. I had a lot of detailed questions to ask and Glenn was patient to answer and expand on every one of them. 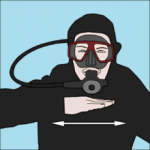 Anyone that knows me will vouch for the fact that I am very detail-orientated when it comes to diving, and I won’t easily accept something unless the person concerned can substantiate their point satisfactorily. Needless to say, Glenn covered every aspect with huge attention to detail and provided very logical substantiation on why and how things were done the way they were. I was impressed. Glenn then allocated me a technical level theory presentation to give. My topic was on ‘Gradient Factors’, which is quite a complex subject, made even harder by a time limit of 35 minutes. I had the evening to prepare that class, along with whatever audio-visual aids I could use to make the lecture more professional and complete. The next task that morning was to demonstrate teaching a full technical equipment set-up. 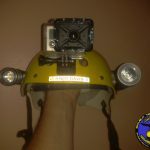 I completed this practical application based on a sidemount configuration, which is something I’m very familiar with. 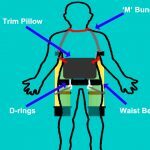 What helped me achieve this task was having a very high attention-to-detail and using a plethora of training aids to demonstrate the necessary process and critical points. 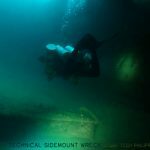 I’ve been teaching sidemount technical diving for a decade, but Glenn still identified a number of ways in which I could refine my presentation and delivery. Those sort of tips are invaluable to an instructor, and really highlighted the highest standards of professionalism that RAID strives to instil amongst its teaching cadre. Having spent the morning covering the requisite formalities, the afternoon was devoted to covering the RAID technical skill-circuit in confined water. As this was a cross-over, rather than a regular technical instructor course, the emphasis was on me demonstrating the skills rather than needing to learn them. Again, every moment of the session was conducted under very stringent buoyancy, trim and control expectations. Having continually striven to improve my tech skills over 15 years certainly paid off during the skill circuit. Nonetheless, Glenn did an awesome job of finding suggestions to improve some of the finer elements of skill demonstration. It was obvious by now that the cross-over was going to be far from an attendance-based ‘tick the boxes’ sort of experience. The course definitely assesses tech instructors to ensure that they are capable of meeting RAID’s high expectations of teaching proficiency. It’s also a great learning experience, even for those coming onto the course with significant experience and competency levels. After several intensive hours underwater, we dragged ourselves back onto dry land and the day concluded with an exceptional meal and more advice from Glenn over a cold beer. Before I could fall into bed, I had to prepare my tech theory presentation for the next day. I woke at 6 am the next morning to enable several much-needed coffees and a wholesome breakfast to get me started before giving my theory presentation. Covering the finer points of Gradient Factors was a tricky task to complete inside 35 minutes, even if I was very familiar with the subject. Glenn was studied my delivery in meticulous detail and asked some demanding questions to test my knowledge on the subject. It was another great learning experience as a professional. The theory session was followed by more instruction by Glenn on the RAID system, courses and standards. Throughout the process, Glenn was a treasure-trove of professional advice and I found that I was developing a huge list of valuable points to take-away and institute into my future teaching. After lunch, we were back in the water to complete assessments on both confined and open-water technical skill presentations. To achieve this task I had to effectively brief, demonstrate and evaluate a number of skills from the skills circuit. 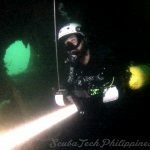 The skills I was allocated to teach in confined water were the backup mask exchange and freeflow 2nd Stage feathering. The valve feathering skill went without a hitch, but the backup mask exchange enabled a number of lessons to be learned. 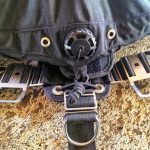 In sidemount, the backup mask is stored in the rear clipped pocket. rather than a thigh pocket, which adds a level of complexity to the process. I would usually teach the pocket remove/replace as a distinct skill before teaching backup mask deployment; so on that occasion, I rushed through the finer details of removing, clipping forwards and accessing the sidemount pocket. Naturally, Glenn picked up on the issue and didn’t let me get away with anything less than perfect. After the dive, we broke down each specific component of the skill and identified how it could best be delivered to the student. Especially important were the points on improving my briefing for that skill and manoeuvring my body to best present the critical attributes as I performed them – more difficult because the skill involves dealing with the pocket at the rear, and then the mask replacement from the front. I had to do a make-up dive the next day to show Glenn a flawless example of the skill. As Glenn had promised, there would be no easy ride through the cross-over. The other aspect that I needed to refresh was with my use of assistants. During the dive, James was acting as my technical divemaster during the skills. I hadn’t had an assistant to help me since I first did my basic instructor training, so there were a lot of points I needed to remember. On this occasion, there was a brisk current running along the shoreline, and demonstrating the backup mask deployment involved momentarily losing some visual awareness. As usual, Glenn was really insightful with his advice and suggestions to improve the student control and supervision when dealing with that situation. We then moved on to the open-water technical skill demonstrations. 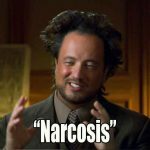 For this session I had been allocated three skills to perform; LPI freeflow, stage/deco remove and replace and the gas switch procedure. These skills went without a hitch, having already learned lessons from the confined water session. After another demanding afternoon in the water, we broke for a typically sumptuous dinner and a few beers to decompress after the demands of the day. I used this time to pick Glenn’s mind on a vast array of professional areas, including how I might expand my business opportunities and activities as a technical instructor. 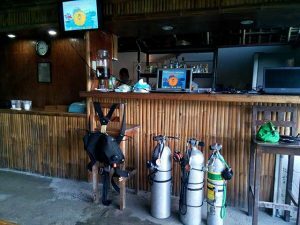 Again, his wealth of experience as a technical instructor and dive centre entrepreneur provided me with a long list of ideas that I can implement in the future. Stay tuned for future developments! I was exhausted by the time my head hit the pillow that night. Day three started at sunrise with coffee and we immediately moved into the second round of confined water presentations. Our the aim was to polish up the assessment scores earned the previous day. Following Glenn’s detailed advice, my performance this time was much more refined. We’d been discussing my progression to instructor-trainer level, so Glenn was aiming to get my scores up to an I.T. course pass standard. Working to that level of proficiency was enormously beneficial to me. I hadn’t enrolled on the course just to easily get some new agency qualifications, but rather to learn as much as I could. Glenn’s instruction, and the RAID ethos of teaching, certainly ensured that I got the most out of the experience. Overall, I have been extremely impressed with RAID as an agency, its course curriculum and training ethos. The technical instructor cross-over with Glenn Campbell reinforced that I’d made a very good decision to represent this agency. The course itself not only illustrated the high instructor standards which RAID is determined to maintain but was also an enormous beneficial learning experience for me on a professional level. I am very excited to now offer RAID recreational and technical courses from 2018 onward. 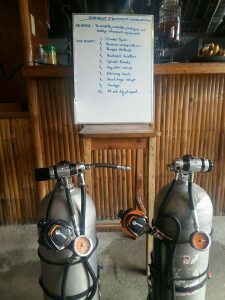 My focus will (of course) remain on the sidemount, wreck and technical programs, but I also want to encourage recreational divers to take advantage of truly excellent RAID programs, like Advanced35 and Deep40. 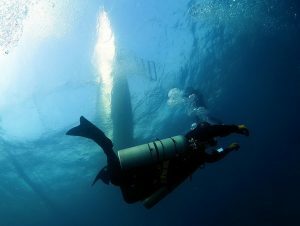 These courses offer a very favourable alternative to the usual standards of advanced and deep diver recreational training that are available. 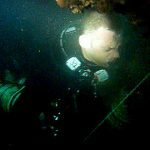 Any diver wanting to develop superior quality diving skills and/or later progress into technical, rebreather and overhead environment diving should definitely take notice of them. Trust me, if they weren’t genuinely exciting and satisfying to teach, then I wouldn’t be doing them. Finally, I’d like to sincerely thank James Omac, Glenn Campbell, Andy Taylor and host of other excellent RAID folks who’ve been quick to welcome me onboard and given freely of their time, assistance and expertise to get me onto the team. It’s a wonderful feeling to be surrounded by such professional and highly motivated bunch of people.